VirTis Freezemobile 25 and 35 Series freeze dryers offer more flexibility, more operational features and moremaintenance conveniences than most other systems on the market. The Freezemobile is ideally suited for peptide production, small scale projects , protein purification etc. The Sentry™ 2.0 Microprocessor Controller offers a highly intuitive operation with At-A-Glance System Status Monitoring. The central control panel has a Synoptic LCD display and a graphical LED display,which displays vacuum units in millitorr, microbar, or pascal. The graphical wave LEDs visually reflects temperature and vacuum levels. Function buttons located on the front of the panel allow users to navigate through the menus located within the LCD display to select operation parameters. 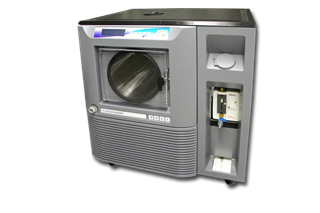 The LCD display also shows condenser temperature, ambient room temperature, vacuum levels, and component status during freeze drying cycles. An audible alarm and LED warn of unwanted process deviations and power outages.